This quiet and beautiful place inspire people who have quiet and beautiful soul! Thanks for not missing this poem 🙂 You are right that only a beautiful mind would be encouraged by such spots to get lost in deeper thoughts!! 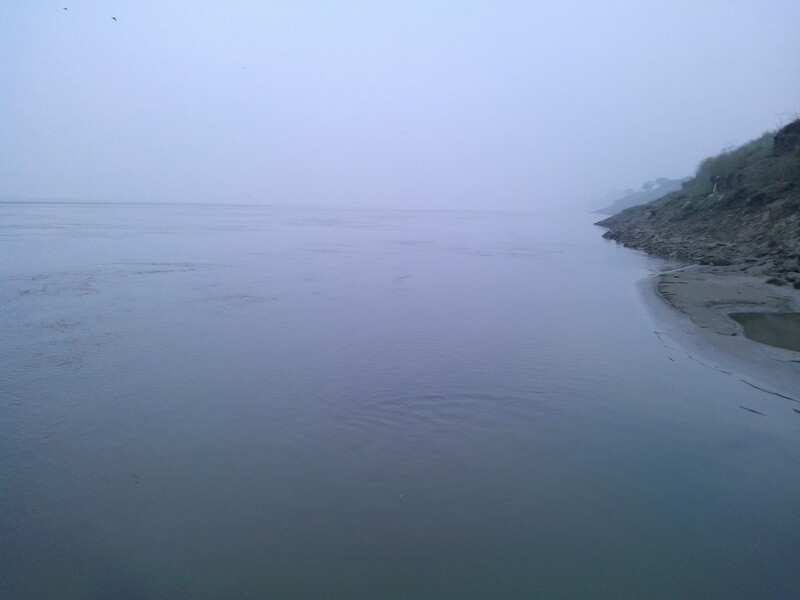 Just wish to inform you that I clicked this image (showing banks of Ganges) at my Village during one chilly winter morning when everything was shrouded in deep fog.. In the Hindi version of this poem, the tree that features in the photo belongs to my village at a spot used by me since childhood to rise above the chaotic world!! Kripashankar Pandey, Mumbai; Daneshwar Pandey, Mumbai; Swami Prabhu Chaitanya, Patna, Bihar; Deewaker Pandey, New Delhi; Mayank MIshra, Varanasi, Uttar Pradesh; Monika Bhandari, Shimla, Himachal Pradesh; Jai Prakash Nryan Sharma, Chhindwara, Madhya Pradesh; Deepak Sarin, New Delhi; Garima Sharma, Chandigarh, Punjab/Haryana; Shahabuddin Mohammed, Ernakulam, Kerala; Dr Nandlal Bhartiya, Gorakhpur, Uttar Pradesh; Himanshu Bhushan Pandey, Siwan, Bihar; Arun Kumar, Regional PF Commissioner, Udaipur, Indian Government, Rajasthan; Rajjan Mishra, Lucknow, Uttar Pradesh and Sudhir Gawandalkar, Bangalore, Karnataka. What a great poem..touched me deeply!! Emotions well expressed Arvind K Pandey ji. Really glad that few words from your “being” made their presence felt on my post.! That convinces me about your presence in virtual landscape 😛 Just wish to inform you that originally I started as poet/short story writer in the world of writing before voice of conscience drifted me towards world of news so as to remain in touch with social/societal obligations! Anyway, poetry/fiction, like first love, keeps manifesting at a regular interval. This poem is one such example of such a manifestation. Happy that it struck a chord with you!! The Time stands still but the world is turning – waters flow down the river, yet nor soul nor spirit can be chased when they keep their flame always burning!